This is my first attempt at a scenario for Command Ops: Battles From the Bulge. It is based around a hypothetical scenario in which Germany has executed the historically planned occupation of Great Britain, code-named Operation Sea Lion. The scenario takes place on a section of the Sussex coast in the vicinity of a town called Rye (the map is hand-traced from a modern Ordnance Survey map). The scenario opens shortly after German forces have put ashore at Camber, and tasks them with capturing a number of local towns to establish a perimeter around a secure beachhead. This was mostly an exercise for me to familiarise myself with the map and scenario editor for this game; the order of battle is roughly based on historical plans, but is by no means 1oo% historically accurate (e.g., I know that the German VII. Armeekorps—consisting of the 7. Infantrie Division and 1. 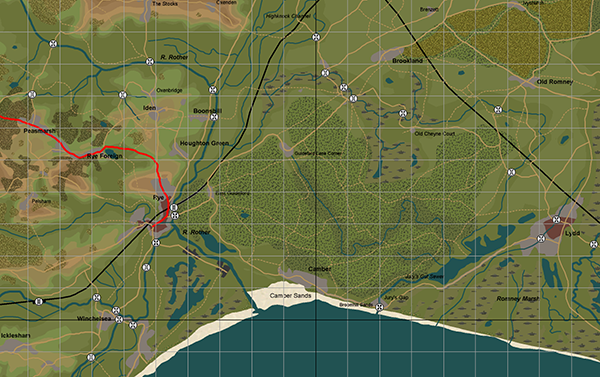 Gebirgs Division—was due to land on the Sussex coast, but some details in the lower OOB and the equipment might be wrong). Having gotten this experience under my belt, I am hoping that my next project will be more closely based on historical records and sources. Download the map and scenario here: https://dl.dropboxusercontent.com/u/55240588/Sea%20Lion%20-%20Rye.zip or here: https://www.mediafire.com/?okxxo2plz7zsufr. Read the Panther Games website feature on this scenario here: http://www.panthergames.com/2014/07/meet-community-work-sea-lion-rye.html.